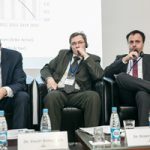 From 24 to 26 November 2016 the 14th Minsk Forum was held in Minsk. The event was organized by the German-Belarusian Society (dbg e.V.) 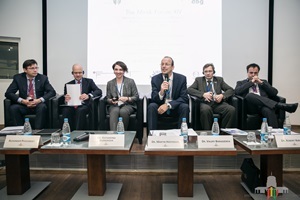 in cooperation with the international education and conference centre IBB “Johannes Rau” in Minsk and the Belarusian think tank “Liberal Club” under patronage of the German Embassy in the Republic of Belarus. The event was opened by Prof Dr Rainer Lindner (Chairman of the Minsk Forum). 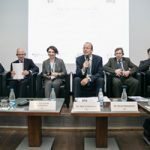 Afterwards speeches were held by Alena Kupchina (Vice Minister of Foreign Affairs of the Republic of Belarus), Peter Dettmar (Ambassador of the German Federation) and other participants. The Minsk Forum was founded in 1997 and became the most important platform of dialogue between German, the EU and Belarus until 2010. Politicians, scientists and NGO representatives from Belarus, its neighbouring countries, the EU and the USA are invited to debate political, economic and societal topics on this international conference. In this year the event could be held in the Belarusian capital for the first time after five years of interruption. 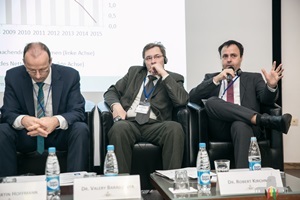 Robert Kirchner, project manager of the German Economic Team (GET) Belarus, held a presentation on the panel about “Economic Transformation in Belarus: SMU Support and Privatization”. He pointed out that in the future SMU support in Belarus should mainly focus on private SMU and that all ministries should be involved in this task. He proposed to set up a credit guarantee fund, from which especially sectors with a promising development should profit. In other panels topics like foreign and security policy and the regional development of the Republic of Belarus were discussed.